Fr. Power began his life-long apostolate immediately after completing his Jesuit studies, when he was appointed to the office of the Eucharistic Crusade which was a branch of the Apostleship of Prayer. For the next 56 years, he was totally involved in promoting devotion to the Sacred Heart of Jesus. 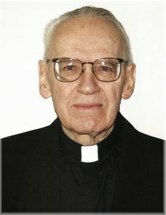 He was National Director, Editor, and Promoter of the Apostleship of Prayer, The Messenger of the Sacred Heart,and the Sacred Heart Program. Fr. Power managed all of this on a shoestring budget by putting in long hours of steady work.